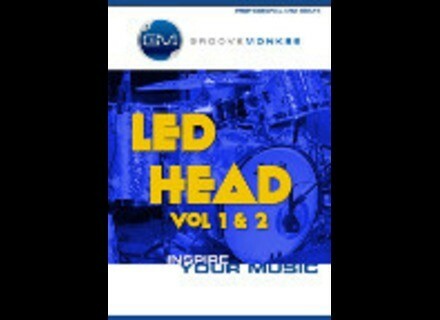 Led Head Bundle, MIDI-File Bank from Groove Monkee. Groove Monkee has just released Led Head, a two-volume collection of MIDI drum grooves inspired by some of the most famous songs by Led Zeppelin. Whether or not you like Led Zeppelin (but would you have read so far if the answer was a straightforward "no"? ), you can't deny the influence John "Bonzo" Bonham has had over generations of musicians - and not only drummers. Remember "that sound" on When The Levee Breaks, right?... Well, of course, Groove Monkee's new release will leave you at the mercy of your virtual drummer regarding the sound itself, but it offers to provide the grooves with the two volumes of Led Head, a collection of MIDI drum grooves inspired by some of the most famous songs by the band. While volume 1 provides ten "song sets" (each divided into distinct parts including Intro, Verse, Chorus, Bridge, Fills, Outros and Endings) inspired by the beats of Led Zeppelin's iconic drummer, volume 2 contains eight complete songs - with both volumes seemingly sharing two songs, although in different versions as their tempos seem to differ slightly. All MIDI grooves are provided in versions formatted for the most popular virtual drummers, and volume 1 also includes PBF File for BeatBuddy. While each volume is available separately for $19.95, Groove Monkee is currently offering a special introductory price as you can get the Led Head Bundle including both volumes for a total $24.95 until January 9th 2016, instead of $29.95 after that date. In case you're tempted to give no quarter on this offer, more details (including sound samples and a slightly disguised -yet easily recognizable- list of included songs) are available at Groove Monkee's website. Special prices on McDSP's 6020 & 6030 plugins This January, McDSP offers special discounts on its 6020 Ultimate EQ and 6030 Ultimate Compressor plugins. 90% off drum sample bundle at The Loop Loft Today only, The Loop Loft offers its New York All-Star Drum Sessions Bundle for $34 instead of $340. [FREEWARE] TBProAudio sTilt phase filter TBProAudio has released sTilt, a free linear phase filter which tilts the audio spectrum around a given center frequency.